One of our oldest baking traditions with Kenya is making sugar cookies. From an early age Kenya loved softening the butter (this quick video shows you a few fun tricks for how to do it), dumping all the ingredients into a bowl, and of course, rolling out the dough. For many years I made my version of this classic with less sugar than is called for in most recipes. After all, sugar cookies don't need to be so sugary that you feel like your teeth are going to fall out -- you definitely want that sweet taste and soft texture, but not to the extent that you need to go to the dentist the second the holidays are over. With Hanukkah arriving so early this year, I wanted to create a special blue and white holiday cookie without the use of food dyes. 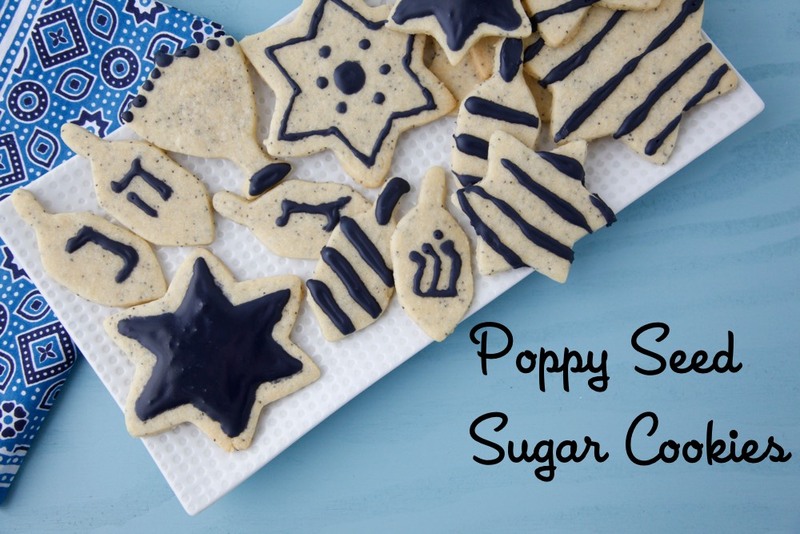 Poppy seeds have a natural blue hue to them and I recently found this awesome line of dye-free fruit and vegetable colors which with just a few drops of produces a bright blue icing for drizzling all over the cookies. 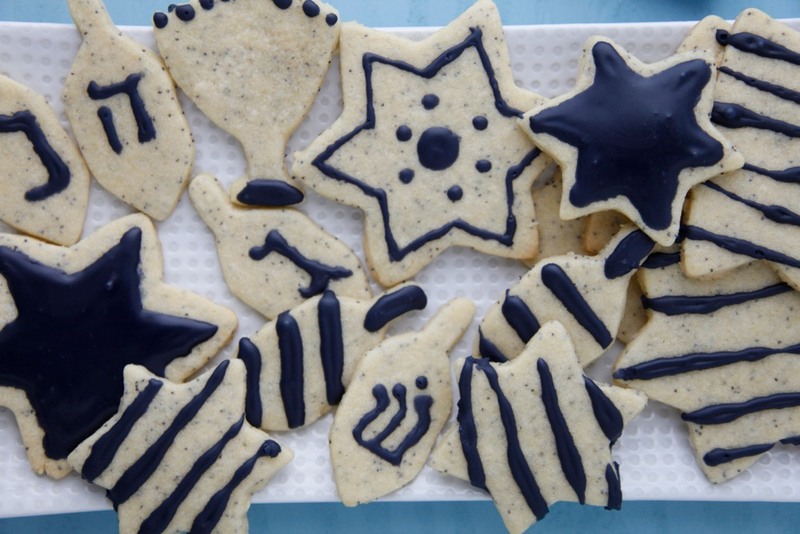 We cut our sugar cookies into all kinds of fun Hanukkah shapes like Stars of David, dreidles, menorahs and more. You can obviously choose whatever shapes and natural dye colors you and your little chemists prefer because these cookies taste just as delicious no matter what they look like! 2. In a bowl, whisk together the flour, poppy seeds, baking powder and salt. Set aside. 3. In the bowl of a standing mixer or with an electric mixer, cream together the butter and sugar until light and fluffy, about 3 minutes. 4. Add the egg and vanilla and beat until incorporated. 5. Slowly add the flour mixture to the wet mixture and mix until a dough forms. 6. Shape the dough into a disk and roll out to 1/4 inch thick. If the dough is too soft, place it in the refrigerator for 10-20 minutes. 7. Use cookie cutters to cut out desired shapes, and bake for 10-15 minutes, until the edges begin to turn golden brown. 8. In a small bowl, combine the powdered sugar and natural blue dye to make the icing. Allow cookies to cool completely before icing. Yum! Thanks for the link for the food dyes I will definitely be picking those up before the holiday baking begins in full! Happy Hanukkah to your family. I can't wait to try this recipe out! I'm so excited.